The group, random acts of culture deadline for turning in postcards for their next show is tomorrow. So of course I did not do mine till the last minutes. Here are my entries. The theme is postcards to Columbus. Columbus used to be called Possum Town, so I did a possum. The postcards are going to be displayed at the Renee Reedy Gallery, located below Main Street Cafe in Columbus. There is a grand opening of the show at 5:30 on Thursday, May 3. Refreshments are provided. The next card is supposed to be landscape and looks that way in the computer, so why is it switching to portrait?? Anyway it is supposed to be the old railroad bridge. Tilt your head to the left..like you are looking at this :-). Here is a link to my friend Julia's submissions...http://juliagraber.blogspot.com/ . The AP and IB art classes at Columbus High are also participating, so there are lots of very creative cards to be seen. This month the technique that Amy Gibson taught on Craftsy.com was English paper piecing. Which is a lot of hand work....and you all already know that is not normally my thing. I must admit, I did enjoy making hexies and joining them up. I used Bonnie Hunter's hexie technique on the small hexies and the one Amy taught on the larger ones. But to help the whole process along, Annette Pennington, who is also doing the challenge, sent this link to Snippets and Blabbery If you look on the right side there is a link for hexagon templates. Yay. I used those for the 3/4 inch hexies. Still needed a template for 1.25 hexies so I found another hexie graph paper here. That is what I used for the medium sized hexies. There was only one large hexie needed so I used the one from the course instructions. For the first block I did not arrange the hexies as Amy had suggested. Amy had you putting a double row down one side. I felt the background was too big. So I made mine into a flower shape and then cut the background down from the 12.5 size and added a small blue border to make it 12.5. Some of the paintings in the room have light blue mats around the edge. The second block I did how Amy suggested, except that she had white as the sky area. I am not sure I like this, I am thinking of trying to do something free form with rectangles to mimic the paintings. This may end up on the back! I still have to go back and do the second string block from last month. Maybe next weekend! 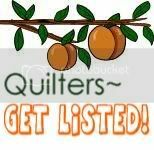 Saw this Link this morning on free motion quilting...I know I will be using this as a reference. What great inspiration! A couple of weeks ago I had a discussion with a friend about making Columbus an Arts destination. There are so many talented people in this town. Not only talented quilters, my usual circle, but other talented people, as in poets, painters, potters, and photographers. Anyway a few days after that, I stopped in my friend Sarah Oswalt's classroom and she was working on a painting during her planning period, and told me she was going to exhibit it at an arts show sponsored by a group called "Random Acts of Culture". The exhibit was going to be in conjunction with Renee Reedy Studio, below the Main Street Cafe. The show was called Emergence, showing the work of emerging artists. I am so glad to see this growing in Columbus. Click http://randomactsofculture.biz/ to visit their home page and discover more from this neat group. Here are a few shots of Sarah and her painting of her youngest son, Jack. Jack looking at a painting of himself. This last two weeks has been pilgrimage week in Columbus. One of the activities the library does to coordinate with the pilgrimage, is to have a display of quilts. The library in Columbus is so pretty. It is one of the prettiest and nicest I have seen in a small town. It has a number of computer stations, that get a lot of action, and a wonderful children's program. We have a lady here in town that runs the story time for kids and goes by Mother Goose. I think every child in town knows and loves her. The library runs lots of special displays during the year and while pilgrimage is going on, they usually display quilts. This year I lent them six quilts. Four were made by my great grandmother Frances Connie Billingsley of Winona, MS. She was my grandmother's (on my mother's side) mother. She passed in the 1950's and my uncle told me she did not make any during her last 10 years of so of life. Apparently green was her favorite color. The other two quilts I lent were made by my grandmother on my father's side, Frances Henwood Turnage. Not sure what she used for batting, but they are very heavy. They put my the ones by my great grandmother in the middle of the one 's by my grandmorther. View from the upstairs balcony. The children's section and adult fiction is upstairs. Someone made one to honor the local university.